The streamers on the Prandtl-D No. 2 as it is launched illustrate how aerodynamic forces are maximized as birds overlap wingtips when flying in formation. 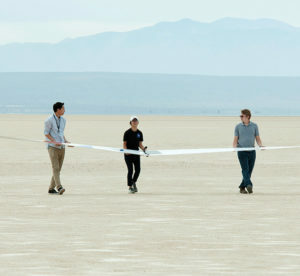 Future aircraft fuel efficiency could be dramatically increased thanks to ideas validated with increasingly complex subscale, experimental, remotely piloted aircraft at NASA’s Armstrong Flight Research Center in California. 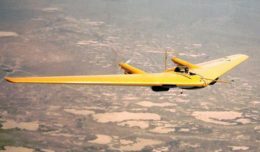 Flights are scheduled to resume this summer on the flying wing-shaped Primary Research Aerodynamic Design to Lower Drag, or Prandtl-D No.3. The project features a new wing design method and a twist. If the concept continues to prove its value, it could forward NASA’s research goals to prove technologies leading to significant fuel economy and emissions reduction. 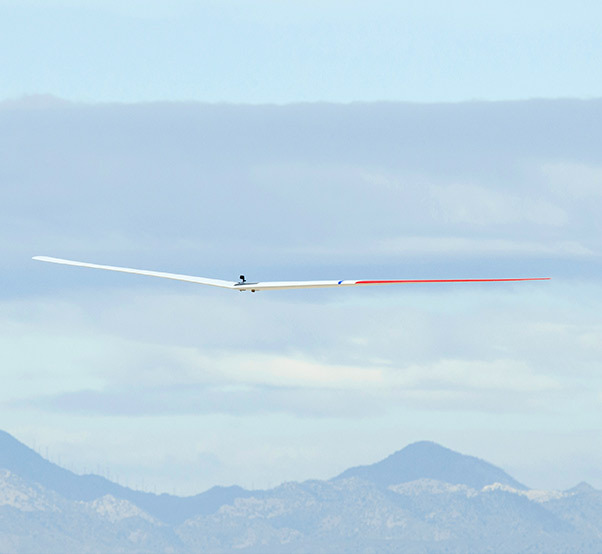 Through a series of remotely controlled-subscale Prandtl-D models in 2013, 2014 and 2015, several with sensors that validated aerodynamic design merits and control expectations of the concept, Bowers, colleagues and students recorded more than three hours of flight data. That research confirms that the bell-shaped spanloading method generates proverse yaw. Proverse yaw is thrust, rather than drag, at the wingtips and makes the aircraft’s tail unnecessary because of the design and not because of the need for electronic controls. The result is greater efficiency and the potential to reimagine airplane design. 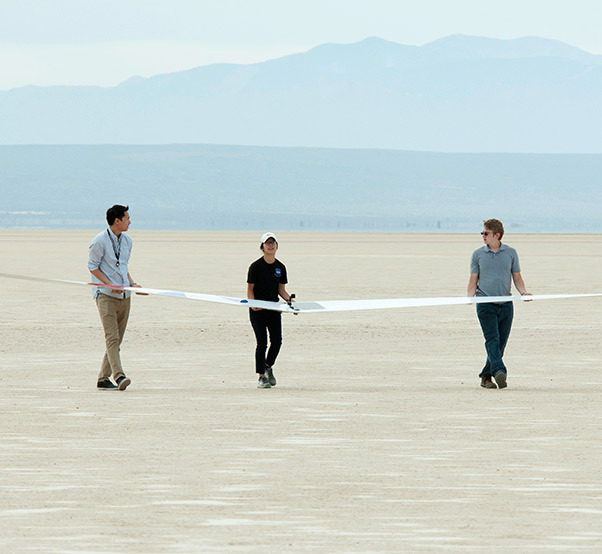 David Lee, Golda Nguyen and Scott Gleason recover the Prandtl-D No. 3 after one of its first flights. Researchers, industry and academia can learn how wing twist and a radically different bell-shaped spanloading — the load distribution over the wing’s span — could lead to a substantial reduction in drag detailed in a technical paper released in March. 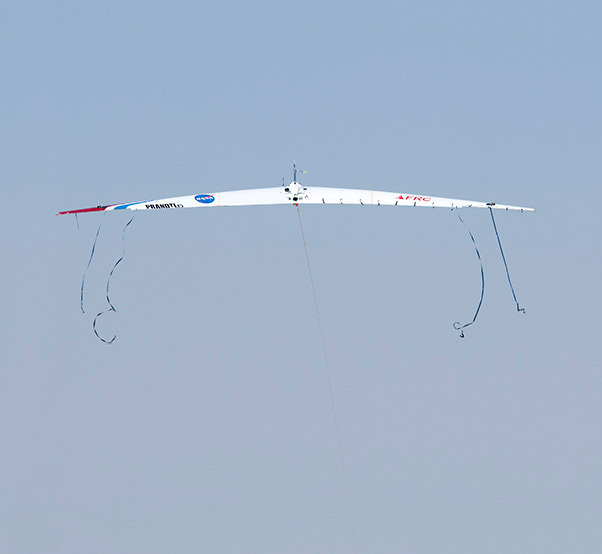 The NASA technical publication is entitled, “On Wings of the Minimum Induced Drag: Spanload Implications for Aircraft and Birds,” NASA/TP – 2016-219072. The publication can be requested electronically, or in paper form, from NASA’s Scientific and Technical Information Office at 757-864-9658, or by e-mail at help@sti.nasa.gov. “The NASA technical paper is the right approach because we heartily encourage open access to the data,” Bowers said. In addition to detailing how the Prandtl-D achieved its data, the paper asserts a corollary to birds. Humans first looked to birds as the model of flight but turned away from that model more than a century ago. Bowers contends that birds are the right place to look. Birds, for example, do not have vertical tails but manage coordinated turns and their wings taper to narrow tips without stalling. Unlike aircraft with standard elliptical spanload, which achieves the best efficiency in formation flight by trailing one wingtip directly behind another, birds fly in formation with their wingtips overlapped. Prandtl-D demonstrates why the overlapping of birds in flight is the optimal aerodynamic answer. 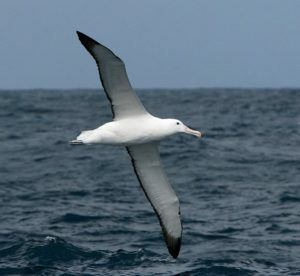 Al Bowers, Prandtl-D project manager and NASA Armstrong chief scientist, believes that birds like this wandering albatross hold some of the answers to efficient flight. 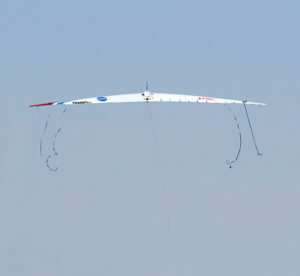 The Prandtl-D wing, which is the foundation of the experiment, will reduce aerodynamic drag by at least 11 percent, Bowers said. 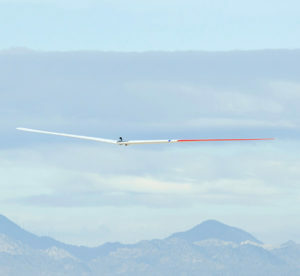 Aircraft that use the Prandtl-D configuration without a traditional fuselage and tail could see fuel efficiency gains of more than three times that, or divide gains to obtain increased speed or range using the same amount of fuel, Bowers said. Thrust at the wingtips is an idea that flies against the winds of traditional aeronautical thought and is now developing wider acceptance. The new research does not preclude traditional methods. The Prandtl-D No. 3 research aircraft is being readied for new flight tests this summer. It had its first flight Oct. 28, 2015. Flight data thus far supports the aircraft wing design solutions first proposed by aeronautical engineers in the first half of the 20th century including Ludwig Prandtl. Prandtl was a German whose research is considered a foundation of modern aerodynamics. The aircraft’s designs are based on glider concepts of German brothers Reimar and Walter Horten and the conclusions of NASA aerodynamics pioneers R.T. Jones and Richard Whitcomb. Aeronautical engineers labor for ways to gain a few percentage points of efficiency and the idea that a different solution could yield such efficiency, “people can’t conceive it can be true,” Bowers said. As Bowers and his colleagues continue to build the case for the concepts proven with the Prandtl-D, the time may be coming for a new paradigm in aviation, Bowers concluded.